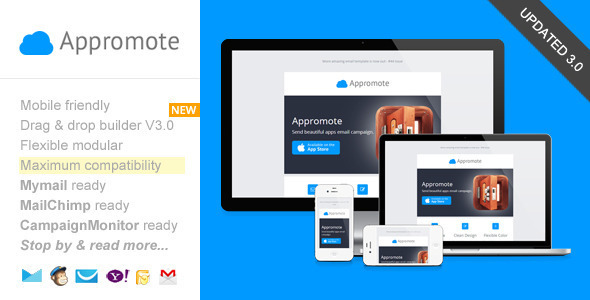 Appromote, Responsive Email Template for App Promo Created by saputrad. This templates have specific characteristics, namely: Drag & drop, add, remove, arrange modules easily. Customize the color schemes, edit both text and image content. Download it in .zip file contain regular HTML and image files . You can use this Appromote, Responsive Email Template for App Promo on Marketing category for apps email template, apps marketing, Aweber, campaign monitor, clean email, corporate, drag and drop email, getresponse, mailchimp, multipurpose email, mymail template, newsletter, responsive email, responsive newsletter, template builder and another uses. Appromote is a minimalist email template designed for app or product promotion, packed with our new, easy-to-use “Template Builder”. It comes with flexible & repeatable modular you can mix and match as your needs. It’s also mobile friendly, adapt to your mobile phones. Also packed with many other additional features like MailChimp, Campaign Monitor, and MyMail ready templates. There’s a detailed insruction from how to upload and setup template in to your MailChimp account, customize it, up to sending & testing email. Added free access to our new, simple, easy-to-use “Template Builder”. Background image that works in all major email clients including old Outlook. 9 unique flexible modular that you can very easy to remix them to create your own layout. Flexible button with inline CSS (guide to create your own button, see next section). Very easy to make your own buttonand flexible to place it as your needs. On-going support along with detailed help documentation files (including the videos) – (cover how to work with PSD file, work with the HTML file, up to sending email with most popular email marketingservices like MailChimp, GetResponse, Campaign Monitor, AWeber, MyMail plugin, and how to create your own button). Easy to copy, add or remove modules with clear comments in codes. Even you can mix and create your own layout variations while everything is still working properly.For MailChimp and Campaign Monitor users, add, remove, move, edit blocks content via their powerful editor. 1 HTML files for MailChimp template , 1 HTML files for Campaign Monitor template , 2 HTML files for MyMail WP plugin templates , and 1 other for regular HTML template. Update 2.0 October 20:Updated Help docs. file. Updated to the Template Builder: Added more advanced template editing features. Update 1.1 June, 11, 2014:Added free access to our new, simple, easy-to-use 'Template Customizer'.- Customize the main color, and background.- Create any number of layout variations using the drag and drop editor, that very simple and easy to use.- Download your design in seconds. Not included on the download package.